South Webster senior forward Shiloah Blevins was named to the first team all-state soccer team in a release by the OSSCA. 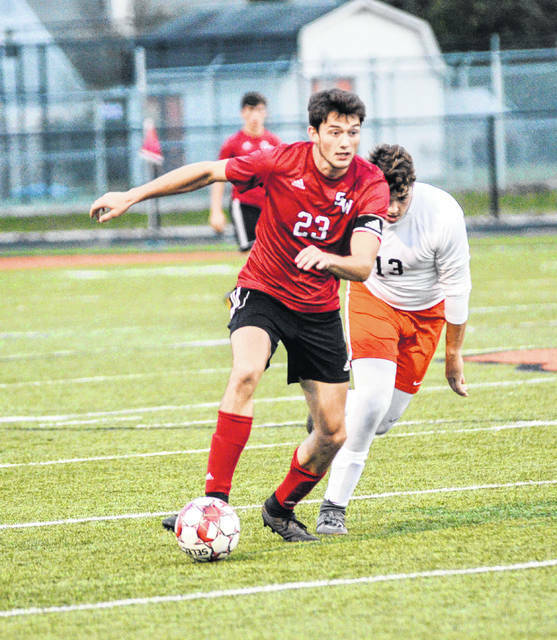 On Saturday, the Ohio Scholastic Soccer Coaches Association (OSSCA) released their all-state honorees for all-state first and second teams, and once again, Scioto County was represented amongst the honorees. The lone Division III first team all-state player from Scioto County was South Webster senior forward Shiloah Blevins. Blevins excellent senior campaign helped lift the Jeeps to an SOC I title, South Webster’s third consecutive district championship, and a regional semifinals appearance. Blevins first team appearance accompanies his award of being named the district player of the year for the Southeast district in 2018. Joining Blevins in the all-state honors is teammate Jacob Ruth who was named to the Division III all-state second team, as well as the first team all-district a week ago. Jeeps assistant coach Kirby Claxon was named Division III assistant coach of the year in the state of Ohio, as well as being named Southeast district assistant coach of the year a week ago. Northwest senior Evan Throckmorton was also named to the all-state second team following a stellar senior campaign which saw the talented midfielder snag SOC II player of the year honors, as well as being named first team all-district. The other all-state honoree for boys’ soccer in the state of Ohio is Wheelersburg sophomore Aaron Jolly. Jolly was named second team all-state in Ohio following a great sophomore campaign which saw the Pirates win the SOC II race outright and reach the district championship where they ultimately fell to the Jeeps. Jolly was one of four sophomores named to the all-state second team, and no seniors were named to the all-state first team. Needless to say, if Jolly continues on his meteoric rise, the sophomore wing has a bright future for the Pirates soccer team. The lone honoree from Scioto County for girls’ soccer among the all-state honors was Wheelersburg senior Libby Miller. Miller was named to the Division III second team all-state during her outstanding senior campaign in which she found the back of the net a school record forty times. Miller was also named the SOC II player of the year, as well as first team all-district a week ago. Wheelersburg assistant girls’ coach Kevin Powell was named the assistant coach of the year in Division III in the state of Ohio. Powell was also named the Southeast district assistant coach of the year a week ago.